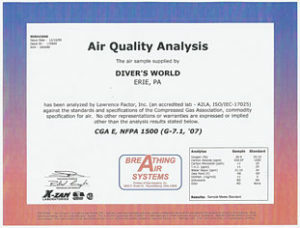 Certified clean and dry air is the most important piece of dive equipment you will invest in. Accept no alternatives to the best air from Diver’s World. Our air is tested quarterly and certified to the highest Compressed Gas Association CGA E, NFPA 1500 standards to meet air safety, quality and dryness standards. With our five bank storage system we provide AIR FILLS WHILE YOU WAIT. We also are the area’s only Nitrox facility offering EAN32, EAN36 or custom blends. Air fills may only be supplied to certified scuba divers. You must present your c-card. 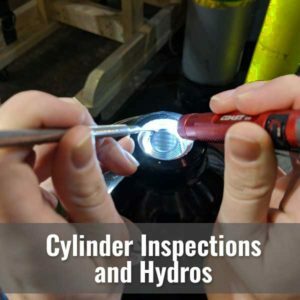 All cylinders must have a current hydrostatic test stamp and visual inspection decal including either the certified facility and/or inspector number. Cylinders used for gas mixtures other than air need to be properly cleaned and labeled including the certified technician’s number. Cylinders received empty will require a [new] visual inspection prior to filling. Never empty your cylinder completely as this can allow moisture or other contaminates into the valve and cylinder. 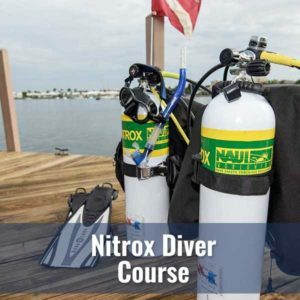 Nitrox fills up to 40% may only be supplied to certified nitrox divers. You must present your nitrox card. All fills must be analysed prior to departing the store and results must be registered in the DW logbook. You are responsible to verify the contents of your cylinder. 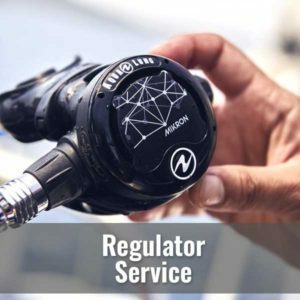 Nitrox cylinders must be O2 cleaned for 100% Oxygen and must be labeled including the certified technician’s number. Factory labels indicating premix Nitrox compatibility are not sufficient evidence of 100% O2 cleaning. The facility that conducted the cleaning (if not Diver’s World or familiar to Diver’s World) may be contacted to verify their cleaning process. Cylinders will not be “overfilled” unless they have a current “+” hydro stamp. Nitrox fills above 40% require the appropriate technical certification from a recognized agency. Cylinders received empty will require a [new] visual inspection prior to filling. 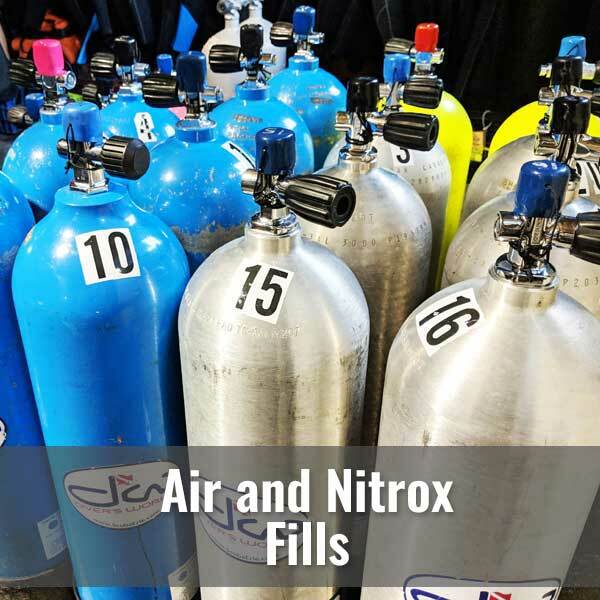 Nitrox cylinders and valves must be re-cleaned if the cylinder was empties of all of its contents. Never empty your cylinder completely as this can allow moisture or other contaminates into the valve and cylinder. Diver’s World reserves the right not to fill any cylinder for any reason.